BERLIN — October 23, 2018 — Following the large-scale deployment of residential Wi-Fi services relying on its core elements, the cloud managed modern home services pioneer Plume, and the world’s largest consumer electronics manufacturer Samsung announced the formation of a new open source software initiative called OpenSync™. The initiative, whose elements have been deployed by Liberty Global, the world’s largest international TV & broadband company, Bell, Canada’s largest communications company, and Comcast, the largest broadband company in the US, creates a silicon, CPE, and cloud-agnostic approach for the curation, delivery and management of emerging residential services leveraging managed Wi-Fi. As the key enabler of this initiative, Plume has open sourced its previously proprietary Plume Middle Layer (PML) software which has already been deployed in millions of homes globally to create the OpenSync™ framework. 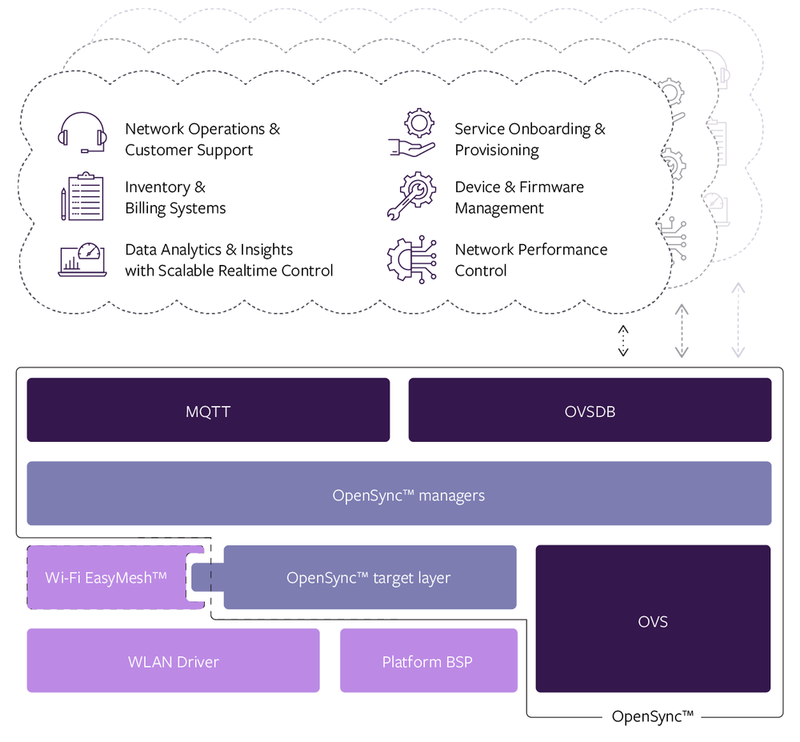 OpenSync™ operates across residential gateways, modems, routers, access points, extenders, set-top-boxes, IoT hubs, smart speakers and other Wi-Fi enabled CPEs to form a common cloud-to-hardware abstraction layer with open interfaces to cloud controllers. The OpenSync™ framework allows for curation, rapid and scalable delivery, comprehensive back office management, and enhanced support of cloud-based services to the consumer. OpenSync™ is available under a BSD-3 open source license and brings an open and extensible framework to build cloud managed services. This framework is compatible with and leverages other open source initiatives and industry alliances such as RDK, OpenWRT and prpl. OpenSync™ components have been pre-integrated into reference designs and SDKs from the industry’s leading silicon providers. OpenSync™ is compatible with and complimentary to the Wi-Fi Alliance’s Wi-Fi EasyMesh™ standard. The benefits of OpenSync’s all-inclusive, multi-vendor approach will be demonstrated at Broadband World Forum 2018, booth #MR15, Hall 21b where visitors will see interoperability of advanced gateways deployed by Comcast incorporating RDK, advanced gateways deployed by Bell Canada and Liberty Global, gateways and extenders manufactured by Sagemcom, Plume designed Pods and SuperPods manufactured by CIG, Sagemcom and Sercomm, and the Samsung SmartThings Wifi AI based mesh system with IoT hub. The hardware featured in the demo use Wi-Fi silicon from three different leading SoC platforms. Master coordination of the network is performed by the Plume Cloud, and features such as Adaptive WiFi™ performance optimization, HomePass® guest and access controls, advanced parental controls with profiles, device and network security features are visible through the Plume App and Samsung SmartThings App. Samsung’s open SmartThings IoT ecosystem, compatible with hundreds of third-party devices from popular brands complements this unprecedented demonstration of a multi-industry, multi- vendor, multi-service, multi-silicon, and open-interface cloud managed home network facilitated by the OpenSync™ open source framework. The initial release of OpenSync™ focuses on whole-home Wi-Fi networking, management and control, the collection of statistics using industry standard protocols such as MQTT, IoT device security, guest access management, and advanced parental controls. Through the accommodation of additional open source components including Open Virtual Switch (OvS™) and OvSDB, and via its managers, OpenSync™ forms the foundation of a truly open ecosystem that extends the scope of this open source effort far beyond basic Wi-Fi mesh interoperability. Plume’s CEO and co-founder Fahri Diner will officially launch the OpenSync™ initiative during a keynote address at the Broadband World Forum 2018 at 10:10 am on October 24. Samsung and Liberty Global perspectives will be shared during a panel session at 3:35 pm on October 24. Plume’s CTO Bill McFarland will discuss technical insights about OpenSync™ at 2:30 pm on October 25. Access to OpenSync™ software, documentation, and license terms and conditions are available at www.OpenSync.io. Plume is the pioneer of Adaptive WiFi™, the world’s first self-optimizing Wi-Fi delivering reliable and consistent Internet experience to every corner of the home, and the original designer and inventor of Wi-Fi Pods and SuperPods. Plume is driven by the Plume Cloud, a powerful cloud-based control plane, enabling the most advanced, resilient home Wi-Fi solution due to its ability to dynamically adapt and respond to changing network loads and interference. An open source common middle layer, OpenSync™ can be integrated into third party hardware for connection to the Plume Cloud. Plume’s cognitive service curation platform enables a rich set of modern consumer services for the home which can run-on third-party hardware platforms and be deployed at massive scale. Visit www.plume.com and www.platform.plume.com. Wi-Fi EasyMesh is a trademark of the Wi-Fi Alliance®. OvS is a trademark of The Linux Foundation. Plume, Pod, SuperPod, Adaptive WiFi, AI Mesh and HomePass are trademarks of Plume.